Standing tall in the ever-changing Manama skyline, the Bahrain World Trade Center continues to push boundaries and lead by example. 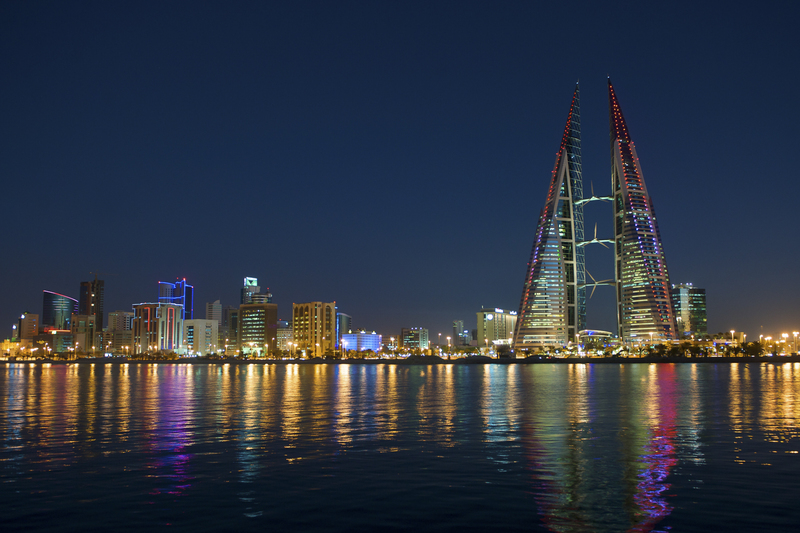 Located in the heart of the Kingdom of Bahrain’s financial and diplomatic district, the 240 metre (787 ft) 50-floor twin-tower mega-structure with its world-renowned façade lighting is an iconic emblem of Bahrain’s modernisation over the last 15 years. Bahrain World Trade Center has showcased the latest advancements in engineering and technology since its completion in 2008. Not content with being the first skyscraper in the world to integrate wind turbines into its design, in 2013 Pulsar was called in to revamp the façade lighting fixtures of the building. Bahrain’s searing heat, humidity, and salt water meant the building’s façade needed a lighting fixture that could withstand this tough climate. Installation was also not an easy task, given the high profile tenants within the building and location of some of the fixtures. Pulsar was awarded the project in part due to our products’ proven ability to remain undamaged by harsh environments. We worked closely with local company Genprise Co. W.L.L. and the client, Facility Managers Cushman & Wakefield, to provide a design that gave a high quality, long-lasting solution which would require minimal maintenance whilst allowing maximum control over the output. For more on lighting control, discover Pulsar’s DMX controller and DMX splitter products. To ensure minimal disruption to the Bahrain World Trade Center’s tenants, Pulsar’s technical team and combined power/data cables supported Genprise in working with the client to achieve an incredibly quick installation, with high standards of engineering and a zero fail rate at the time of commissioning. The project used more than 200 specially-made ChromaFlood 50 low voltage LED lighting fixtures with customised brackets to create a stunning façade. Since 2013, these stunning light displays have adorned the East and Western façades of the building, capturing the eyes of millions with the colour changing LED lights for which Pulsar is so well-known. Such was the impact of the design, social media was flooded with pictures and tweets, and many other buildings have been inspired to revamp their façade lighting fixtures as a result. 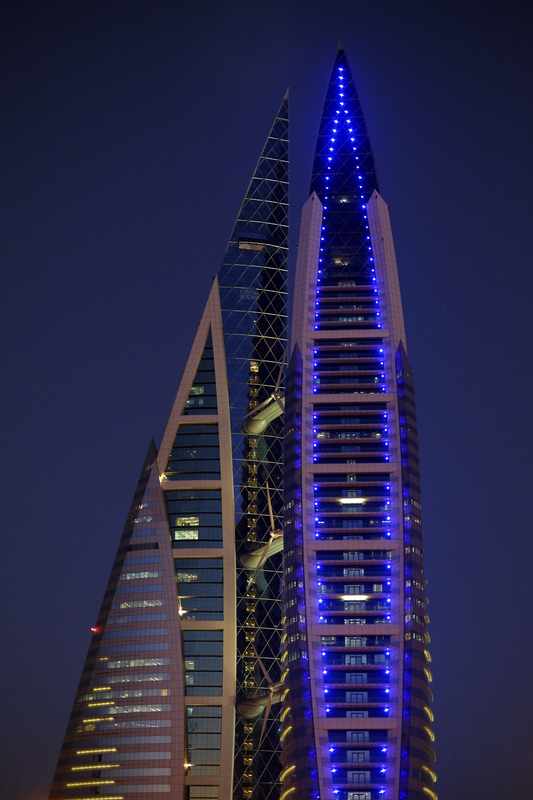 In Bahrain alone, Pulsar has worked on numerous projects including transforming the façade skyscraper lights at the headquarters of Bahrain Islamic Bank (BISB), and designing eye-catching exterior architectural lighting for Seef Mall, the second largest shopping mall in the Kingdom of Bahrain. Pulsar delivered cutting-edge, world-celebrated façade lighting, ultimately adding great prestige to the Bahrain World Trade Center. A glamorous, yet reliable and low-maintenance, future-proofed lighting fixture is now in place.